This beet hummus is as delicious as it is beautiful with vibrant pink color, earthy flavor, and healthy as can be with over 7 grams of protein per serving. Had enough beets lately? I’ve been on quite the beet kick myself. Still not sure if I love the flavor or the pink part most. It makes recipes like this beet hummus looks like unicorn chow (since unicorns would eat hummus if they existed obviously). Our household has been so into beets lately, both Ted and I went grocery shopping separately and each of us bought two bunches of beets. Sooo, with beets now taking up an entire drawer of the fridge, they’ve been on the menu regularly. Not even counting this beet hummus, we’ve had beets in our diet in some shape or form every day this week. With all this beet action, there have been a few beet faux pas. In my over zealous infatuation, I forget that not everyone loves beets. In fact, lots of people absolutely loathe them. I’ve fed beets to beet haters on two separate occasions this week without even thinking about it. The first person ate them and then politely pushed them to the side. My uncle on the other hand, was a bit more vocal about his displeasure at find one lurking in the salad at Easter dinner yesterday. Muhahaha. I get sneaky with ‘dem beets. Well, there’s no sneaking around with this hummus. The color is a dead give away that there’s an earthy pink root mixed up in there. You can definitely taste that telltale beety flavor in this hummus. The other ingredients complement it in a way that brings out the best in the beets though. 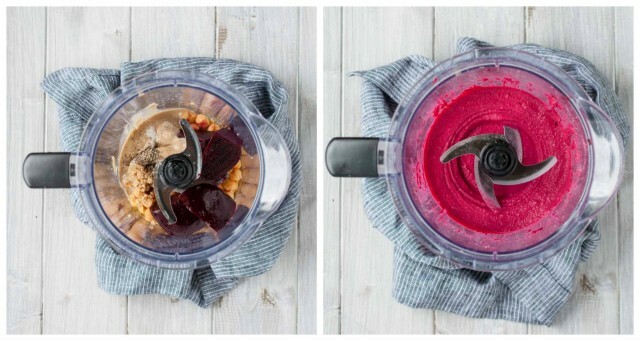 Plus, if you’re a beet addict like me and have a few pre-roasted beets stashed away in the fridge, this beet hummus can be ready in under 10 minutes. I love pre-roasting beets and then just keeping them on hand for a couple days to toss into salads, smoothies, and whatever else strikes my fancy. I’m all about meal prep efficiency tricks, and this one is a total time saver. Topping options for beet humus are endless too. The only one that I consider necessary is the dill, since it really helps balance the beet flavor. 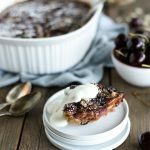 I added it knowing how well dill and beets pair together in Russian dishes like Borscht and the combo is spot on in this recipe too. The pine nuts and feta are technically optional, but really add a lot to the dish. If you’re vegan or dairy free, you can leave the feta off without missing a beet too much, but if you’re not, do yourself a favor and sprinkle that salty cheesy goodness all over. Other topping options that are on my list to try are hemp hearts and crushed pistachios instead of pine nuts. Yum! For a lower calorie alternative to crackers, try eating this with freshly cut veggies like cucumber, carrots, and red pepper. Its a tasty yet healthy snack with enough protein to make keep you full until your next meal . This is my MO for my mid-afternoon saltiness craving. Instead of mindlessly munching on chips, give hummus and veggies a whirl. If you’ve tried and tried but beets still just aren’t your thing, check out these other hummus and bean dip recipes. You’re bound to find another combo you’ll love! Place all hummus ingredients in blender or food processor and pulse for 2-3 minutes until smooth and creamy. Stop several times and use a rubber spatula to scrape the sides to ensure an even consistency. Start with 3/4 tsp. salt and add more to taste. Similarly, add 2 Tbsp. water at first and add 1 more if hummus is still too thick. Scrape hummus into a serving bowl and top with dill. If desired, top with toasted pine nuts*** and feta as well. *Roast beets by wrapping in aluminum foil and placing in oven preheated to 425 and cooking for 45 mins to 1 hour depending on the size of the beet. Detailed instructions are provided in my recipe for Sautéed Beet Greens with Roasted Beets. ** To make hummus extra smooth, remove chickpea skins before blending. My Buffalo Hummus recipe has instructions on how to do this. ***To toast pine nuts, place in a small pan over low heat. Stir often for 6-8 minutes until nuts are lightly toasted and smell nutty. You can microwave for 40 seconds to 1 minute instead if desired. This beet hummus is gorgeous, I just love the vibrant colour, I have yet to taste or make beet hummus, but I happen to have roasted beets in my fridge and some chickpeas, so I think I’m destined to make this.